TOUR GUIDE RESPONSE: Thanks, Steven, very happy spending the morning with you both. Have a great holiday! TOUR GUIDE RESPONSE: Shekar, it was a great pleasure to take your lovely family round the city, and I'm delighted you enjoyed the tour. Jim was a fantastic guide. He was very responsive to our interests and very knowledgeable and energetic. During our 4 hours, we learned so much about Barcelona's history and current culture. We highly recommend Jim to any visitor to Barcelona. What an amazing morning in an awesome city. Thank you Jim! TOUR GUIDE RESPONSE: It was a lovely morning, thank you, too, for making it such fun. Jim did a really nice day in Barcelona for us that included places we had never been, despite the many times we have been there. He also arranged tickets for Sagrada Familia for the perfect time of day. We would book Jim again. TOUR GUIDE RESPONSE: Thanks, Mary. Jim met our plane, took us around Barcelona, including the long stop at Sagrada Familia that we'd requested, and then dropped us off at the cruise port. Though we'd visited Barcelona on two previous trips, we learned many new things about the city and its history from Jim. He's a great guide who communicated his knowledge and love of his adopted city. TOUR GUIDE RESPONSE: Thank you to you, too, for a most enjoyable and stimulating morning. Jim did a wonderful job of showing us the most important points of Barcelona. Would go again with him. TOUR GUIDE RESPONSE: Thanks, Craig, it was a really enjoyable day, and I hope you all have a great time while you're in Spain. It's hard to imagine a better guide than Jim D. He is well-educated, well-informed, thoroughly knowledgeable, extremely personable, cooperative, kind and patient. Born, raised and educated in Britain, he has an excellent command of E english. Having lived in Barcelona for many years, he knows the city intimately. TOUR GUIDE RESPONSE: One of those tours you want to extend indefinitely, so many interesting things to talk about. Thanks to both of you for such kind comments. Jim was amazing! He met us at the port on time. Best guide for English visitors to Spain as he is from England. We had a great day touring with Jim. He had great knowledge...we learned so much. Highly recommended! The winery and the Montserrat are must sees! Thanks Jim!! Jim was a great guide and a gentleman of the world. The drive to Monserrat is about an hour each way, and we truly enjoyed talking with Jim the entire time. He is extremely knowledgeable and well read, and is — I think — a can't-miss guide. Thank you Jim. Jim was EXCELLENT! He is very knowledgeable, articulate, versatile and totally delightful! He was very detailed to allow us to maneuver what I wanted to see/do in the time frame allowed. Jim is a SUPER FIVE-STARS! AND MORE! JIm was fabulous! And very knowledgeable.. thank you!!! Terrific introduction to Barcelona. Jim sprinkled history, politics, current events and much more into our three hour tour. Very personable. He zipped us around to the key sites so we got up close to everything. Very good pacing for us. We strongly recommend Jim for any visitor. When we return to Barcelona, we hope Jim will be available again. Jim was a wonderful guide. He was flexible, extremely knowledgeable, and a delight to be with. He made our visit to Barcelona excellent. There were 4 of us and we all agreed that we couldn't imagine having a better guide. He was the best! TOUR GUIDE RESPONSE: For me too, the most enjoyable way to show the city, with interested, informed companions. Many thanks. Jim gave us an excellent introduction to the city of Barcelona: history, architecture and cultures, with flexible accommodation of our special interests. TOUR GUIDE RESPONSE: A stimulating afternoon all round, many thanks. Jim did a great job of showing us the sites of Barcelona. We had a custom tour with many special requests, and he was very accommodating of all our needs. We really appreciated his perspective on the city, and would highly recommend him! TOUR GUIDE RESPONSE: Hi Rachel, I'm glad you all enjoyed the visit, and I hope you get in touch if you decide to come back. Jim was very personable and very knowledgeable. We enjoyed our tour very much. Jim was very friendly and extremely knowledgeable. He tailored the tour to our specific areas of interest. He was able to pack a lot into such a relatively small amount of time. His love of the history of Barcelona made our tour with him more meaningful! Jim was a fantastic host. His thorough knowledge of the history and flavour of Barcelona was outstanding. We shared many laughs and would highly recommend Jim as an excellent guide. Jim was our first Tours By Locals guide - we have already booked our second guide and will ensure we keep this service handy for future travel plans. Jim was a very knowledgable, friendly host for our introduction to Barcelona as he drove us around the highlights of the city. He was also fun and comfortable to be with while providing a historical overview which helped us navigate on our own for the coming days. There was not a question he could not answer about the city he loves. Thank you Jim! TOUR GUIDE RESPONSE: Thank you, Jim, it was a really enjoyable outing. We were four seniors and Jim was perfect for our 1/2 day tour of Barcelona. Picked up at our hotel and took his suggestions. Monjuic for amazing views of the city, a quick look in the art museum, through the historic district and onto the Monjuic park for more views, to 1992 Olympic stadium and other monuments and buildings erected for the1888 Worlds Fair. Walk around outside of Park Guell for photos, a visit to El Born ruins, look in St Mary's by the sea. Drop off at Sagrada Familia for pm tour. Jim is an excellent tour guide and we enjoyed our time with him very much. He was very knowledgeable about Barcelona and educated us with history, politics, languages and the development of the city. He also a sense of humor and engaged us the whole trip. We recommend him very highly. Jim D. is a charming, knowledgeable, accommodating guide. We enjoyed our tour of Barcelona by car covering most major sites while sparing my husband's problem knees. Jim offered amusing comments along with the Important historical framework of this beautiful city. TOUR GUIDE RESPONSE: Mary, that's very sweet, I also really enjoyed the afternoon with you. Very friendly , knowledgeable, and had a great time. A bit disappointing not able to enter Gaudi church or park. However, this was not the guide's fault but due to too much to see in such a short period of time. If travelers wish to enter church and park probably best to go online before trip and purchase tickets to skip the long lines. We did this for Picasso Museum. Jim was excellent and kept us entertained by showing us so many beautiful sites of Barcelona! I would highly recommend using him. Jim was very hospitable on my 3-hour overview tour and knowledgeable of Barcelona. He was easy going and flexible with where and what I wanted to do on the tour. We walked around the popular parts of Barcelona and drove around the city. I highly recommend Jim for a tour! TOUR GUIDE RESPONSE: Thanks, Megan, it was a lovely spending the morning with you. Enjoy the rest of your trip! TOUR GUIDE RESPONSE: Hi Kari, great. so did I, a delightful morning with all four of you. Tour guide came to pick us in an extremely dirty car, Not worried about the outside but the inside was so dirty my husband told him he left his breakfast on the chair, he just tried to brush the dirt from the chair. I was very very disappointed!!! TOUR GUIDE RESPONSE: Dear Rosemary, I was mortified to find I hadn't checked over the car before collecting you from the terminal, and sad that it spoiled what I had thought was an enjoyable tour. Thank you Jim for an excellant tour of Barcelona. It wasn't Jim's fault that the date that our cruise was in Barcelon was a "Holiday" and everything we visitied was extremely crowded. In spite of this, we had a great tour and learned a lot about the city. Jim is an excellent guide. He showed up at the hotel before time, was very professional and courteous, and helped us make the most of our time in Barcelona by showing us the highlights of the city up close. He is well versed in the history and culture of the region and a native English and fluent Spanish speaker. We were very pleased with our experience and would highly recommend Jim to anyone visiting Barcelone. TOUR GUIDE RESPONSE: Thank you very much,Karim, I hope you both return soon. My family had the opportunity to tour Barcelona with Jim. It was a very enjoyable experience. Jim was very flexible in attending to some special needs of our family and was great in sharing the history of Barcelona as we strolled through the city. His amiable and easy going style allowed us to feel as if we were touring the city with someone we had known for while, and not someone we had just met that day. I highly recommend him. Great tour. Jim knows so much about Barcelona and took me many places I couldn't have seen otherwise. I highly recommend his tour. TOUR GUIDE RESPONSE: It was a fun morning, great to show a pro around! Excellent day with Jim. Very informative. I have restricted mobility, but Jim made sure I was taken care of throughout the day. Being able to arrange our day to suit our requirements was great, as we have been to Barcelona before, and could visit areas we had not seen, rather than just doing the usual "once around the tourist sites". TOUR GUIDE RESPONSE: It was a very enjoyable day, and I am so pleased it was what you wanted. Tour was excellent. Our guide, Jim, extremly knowledgeable and a pleasure to be with. Next time in Barcelona I would seek him out. Thank you for connecting us up wit Jim. TOUR GUIDE RESPONSE: Thanks, Lewis, it was a lovely morning and I hope the rest of your holiday went well. We gave Jim quite a challenge: we engaged him to pick us up,with our luggage,from our hotel, plan an 8 hour tour which 2 eighty year old+ clients could undertake and enjoy, pick them up, with their luggage, from their hotel, and then deliver us and our luggage to the airport. He was kind, attentive, and knowledgeable, and we praise him highly. He brightened our last day in glorious Barcelona. TOUR GUIDE RESPONSE: Dear Zvi, it was a privilege and a pleasure to spend the day with you both, I wish there was still the opportunity to talk with you about so many interesting things and enjoy your company for more time. Best wishes and many more travels. TOUR GUIDE RESPONSE: And for me too, many thanks. Jim was an excellent tour guide! He customized our tour when he met us to cover sites that we had not previously seen. We appreciated his flexibility. Jim was very easy to understand as he is British. We highly recommend Jim for a tour guide! TOUR GUIDE RESPONSE: Thanks Sheryl, I hope the Eiffel supper lived up to expectations. Jim was an awesome guide and we had a great time. He went above and beyond for us. Highly recommend him! TOUR GUIDE RESPONSE: Thanks, Ron, glad you enjoyed the day and got home safely. Jim is a great guide! Did just what we agreed to which was to have us see sites outside Barcelona. Wish he could have been our guide for the entire time we were there. James was on time to pick me up. He verified with me the plan for the day and allowed me to make choices. Overall, he is knowledgeable in the subject and with the geographical area. In addition, he demonstrated to be friendly, easy going and attentive. Without any reservations, I recommend James as a tour guide in Barcelona. TOUR GUIDE RESPONSE: Thanks, Bertha, we had a lovely morning exploring the city. Jim is knowledgeable, easy going, prompt and fun. We enjoyed our three different days of touring with him. TOUR GUIDE RESPONSE: We laughed a lot, I enjoyed the whole trip. Great walking tour, especially as an intro to Barcelona. Jim knows his architecture. He was very good at pointing out where we might want to spend more time, and in understanding our interests. Not only did he thoroughly introduce us to Guadi, but we never would have known, e.g., about the Roman city underneath the cathedral (with its 4th century winery), without his guidance. Great tour. Great guide. TOUR GUIDE RESPONSE: It was a lovely morning, sunny and bright, and we talked about everything under the sun. We enjoyed an informative tour with Jim, during which we got to see important buildings and to learn the importance of various events to Barcelona's history. TOUR GUIDE RESPONSE: Thanks Linda. TOUR GUIDE RESPONSE: Thanks Leanne. We spent a wonderful day touring with Jim. He is friendly, knowledgable, & an excellent driver. He helped us make the best use of our time to see sights we had not seen on a previous visit. We wish we had booked him for two days. A great guy & we would highly recommend him. Thanks, Jim. Jim did a good job making our diverse group happy touring Barcelona. We got a good mix of historic and contemporary with excellent commentary along the way. Great information, good listener in regards to our interests, native English speaker, flexible when we needed it. You cannot choose better! One could not find a more informative, cordial and accommodating guide..anyone going to Barcelona will enjoy his custom tour and his vast knowledge of the city. Jim was very informed and a pleasure to spend the day with. We enjoyed Montserrat as well as lunch with Jim. Our tour with Jim was PERFECT. It was exactly what we were looking for. We saw a LOT of the city of Barcelona in order to get our bearings for the rest of our week there. Jim knows the city really well and we totally enjoyed the history aspect of how he shared the city with us. Jim is a really nice guy and enjoyable to be with and he really gave us a great grounding for a great trip to a great city! Jim had let us know that we could do some of, or most of, the tour by car and this was wonderful. He met us at our hotel. He was exceptionally knowledgeable and we learned much more than expected. 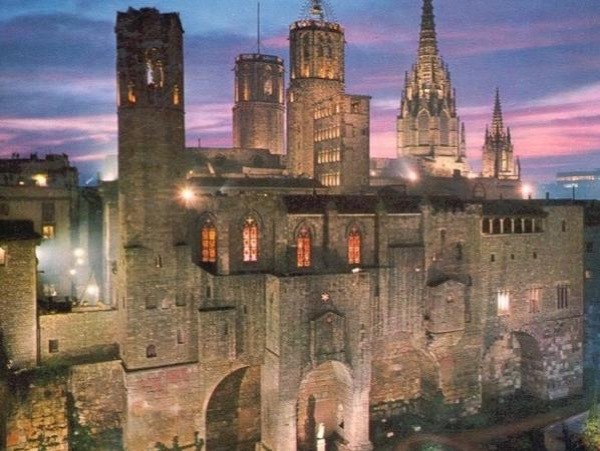 Jim routed us to places we had not seen as we had been to Barcelona before. It all worked out really well and he left us downtown at a great spot for lunch, from which we could get back to the hotel without getting lost. A great visit! Excellent tour and Jim is an excellent tour guide. We thoroughly enjoyed our tour of the best of the Catalan with Jim. Jim is very knowledgeable and is a very pleasant person. We got to drive around Barcelona and see a tremendous overview of the city. It was a great complementary tour to a separate walking tour we took of old Barcelona. Would highly recommend this tour. We really enjoyed our tour with Jim. The sights were beautiful and interesting, but the real gem is Jim. He is filled with knowledge about Barcelona's history and all of the current issues. We found him informative, funny, kind, and a wonderful host. Although our tour covered areas outside of Barcelona, we wish had been able to have him tour us around the city. Can't say enough good things about him - fantastic experience! We'll definitely look him up the next time we return to Barcelona. TOUR GUIDE RESPONSE: Thanks, Julie, it was a memorable day. I hope you found the book shop you wanted in London. See you next time you come by Catalonia, maybe we'll be independent by then. Jim is a wealth of knowledge and provided us with a great understanding of the local culture and incredible architechure in Barcelona. He was very accommodating to our schedule and able to work changes in on the fly. We would defiantly hire him the next time we're in town and very highly recommend him. TOUR GUIDE RESPONSE: We had a lovely morning exchanging our experiences and stories, it would be great to do it again. I had only a few hours to spare in the city of Barcelona , Jim was my guide. He was excellent . Full of knowledge and enthusiasm to share combined with a laid back easy going disposition . In a hectic city he offered a safe passage through all the hustle and bustle and allowed the beauty of the city to be revealed at ease I would highly recommend him ,and I will definitely request him again the next time I'm in the intriguing city of Barcelona. It was an excellent walking tour of Barcelona. We got a perfect overview of the city. James made the tour fun and very interesting. We can highly recommend him!!! Thank you James for this amazing tour!! Jim was an excellent tour guide. He has an easy personality and a lot of background knowledge about the history of Barcelona and the sites we saw. He asked us what we were interested in and then customized a tour. We covered a lot of ground in 4 hours. We really enjoyed his thorough knowledge of the city, thee arts and the architecture. Would highly recommend! Do NOT visit Barcelona without touring with this guy. He is engaging, entertaining, knowledgeable and cool. There were 8 in our group and he connected well with all of us. It was like hanging out with Gaudi. He knows history, architecture, politics and the culture of Barcelona. He's a charming Brit who makes you feel like a local.